Spend any time on the site and you will quickly learn I love Alien. 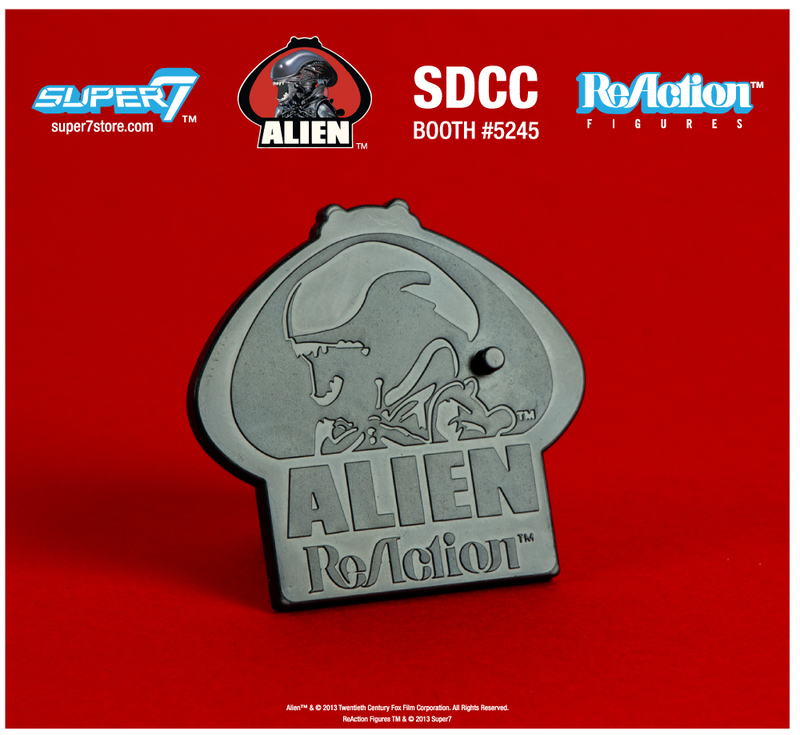 I was a huge booster of Super 7 when they were working on the first set of ReAction Alien figures, so when they announced the Playset, I lined up at SDCC to order it. Nearly a year later, it finally arrived. I loved my old Star Wars cardboard and plastic Hoth sets so I had high expectations for the Alien set, and they were largely met. The quality of the plastic base and the cardboard are excellent. But unlike the Hoth sets, the backing on the alien relies on some pretty long flange pieces to hold the backing in place, so you need a good 4 inches or more of extra space behind the set for display purposes. The graphic on the cardboard is quite good, although a little dark. A nice touch is the shot of the Jaugernaut at the top. Photos below if my boxing. 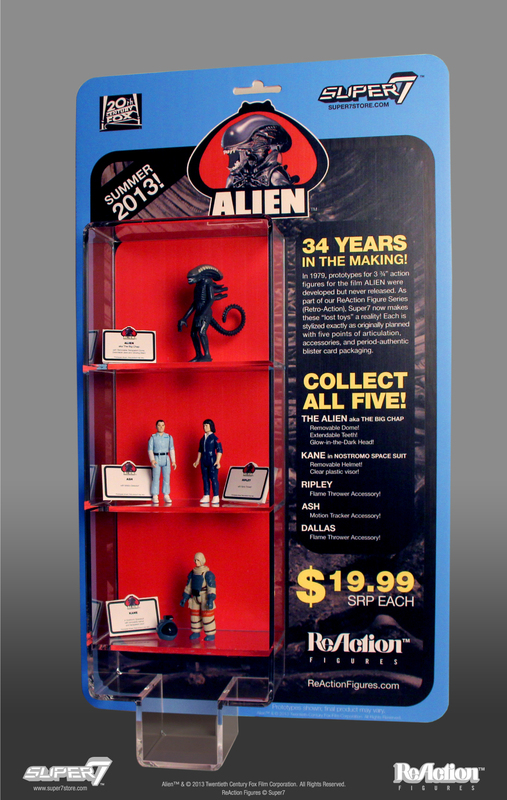 If you’re an Alien fan, it is a pretty great addition to a collection and looks great next to the Super7 “Early Bird” Alien display stand if you managed to pick that up. Going to San Diego ComicCon? Love the classic sci-fi film Alien? 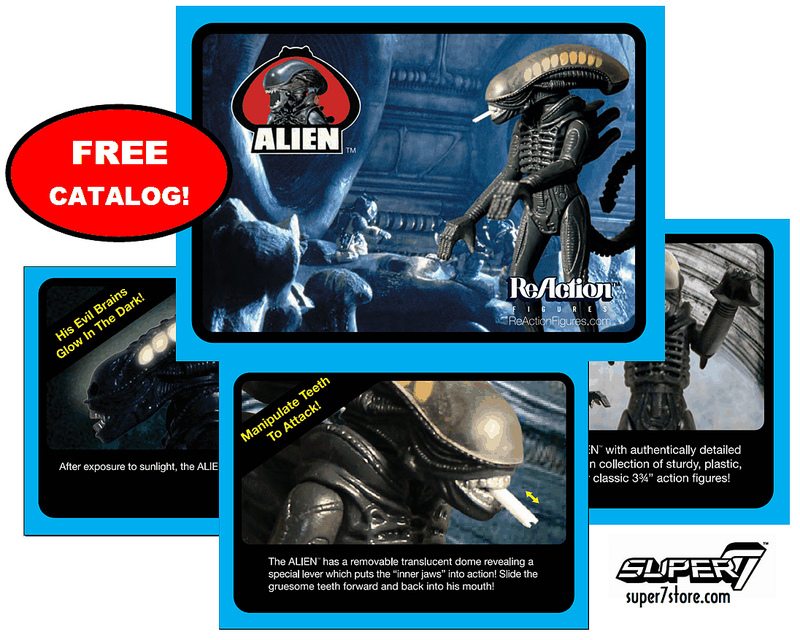 Super7 will soon be releasing a line of Alien toys based on a discontinued set of Alien toys from 1979. I’ve been writing about these figures since last SDCC and am super excited about them. Last week, Super7 announced the new goodies they’ll have at this forthcoming SDCC. Behold! 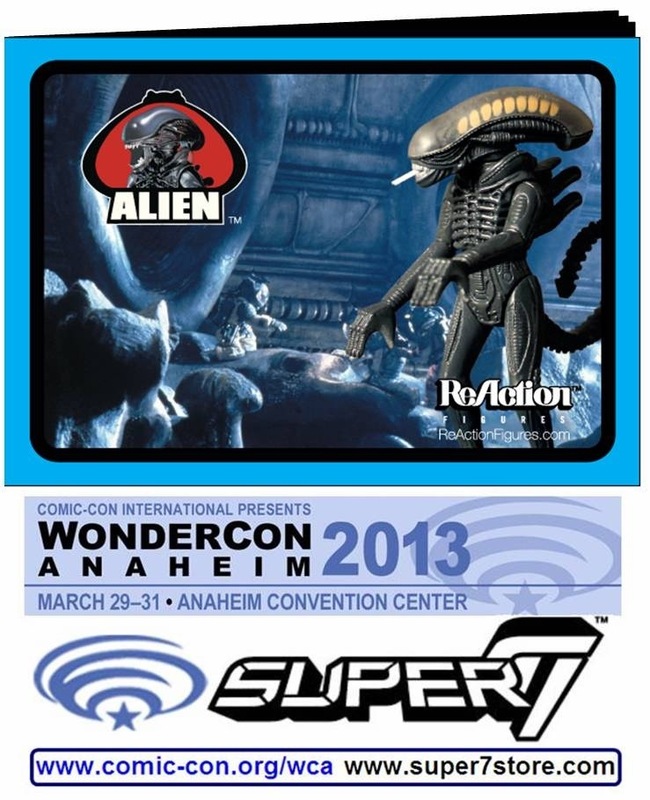 Super7 Alien ReAction SDCC Exclusives that will be available at the show! Remember the Star Wars Early Bird package? A platform that the figures could stand on and a cool background? 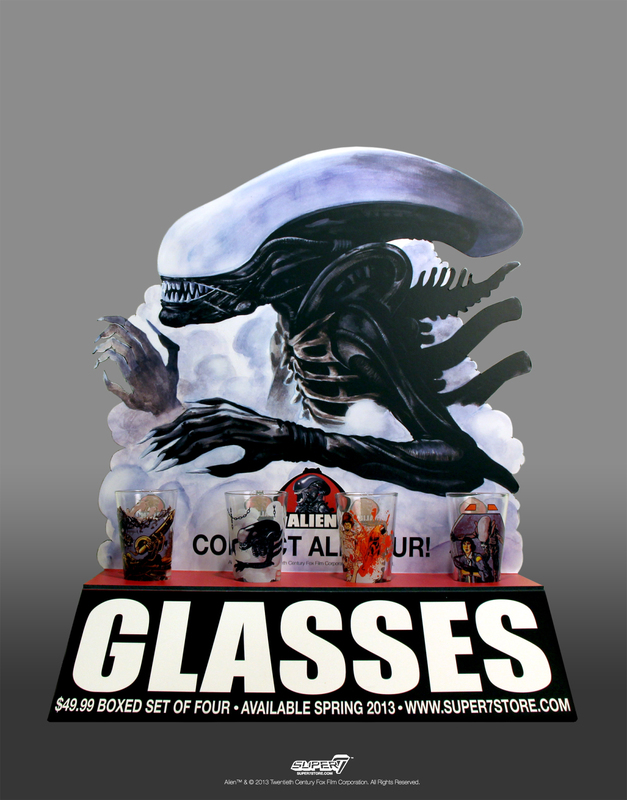 Super7 has recreated that wonderful beast in the form of an Alien display stand. In addition to the stand, you get a Space Club Membership Card, ALIEN photos, and a sheet of ALIEN stickers! Just pre-order the full set of figures for $100 and they’ll hand you the Early Bird Package on the spot. Super7 is producing two unpainted figures and selling them as discontinued “sales samples” that a toy salesman from the 70’s might have toted around at the 1979 Toy Fair. They come complete with a box and catalog with “Canceled” stamped across them. Unlike the Early Bird, you can actually pick this baby up at San Diego for $40. If you have old Star Wars figures, you know they have a hole in the foot so you can peg them to a playset. The Alien ReAction figures have those same holes, and Super7 has made some cool branded figure bases that will keep your Ripley standing no matter what Big Chap throws at her. Best of all, they’re free, just sign up for their mailing list at SDCC. Remember the mini-booklet toy catalogs you used to get with your toys? This is Super7’s version documenting the Alien ReAction figures. To get this one, just show up! I’ve written about it before, but Super7 just released some great photos of their new Alien figures that they’re releasing under their ReAction Figure Series – ReAction being short for Retro Action. You probably already know the story, but in case you don’t, back in 1979, prototypes were made for a series of 3 3/4 inch Alien figures. With the failure of the 18 inch Alien, the toy line never got made. But Super7 managed to track down reference material and the original prototypes, and under license from 20th Century Fox, is bringing these never before released figures to xenomorph lovers everywhere. 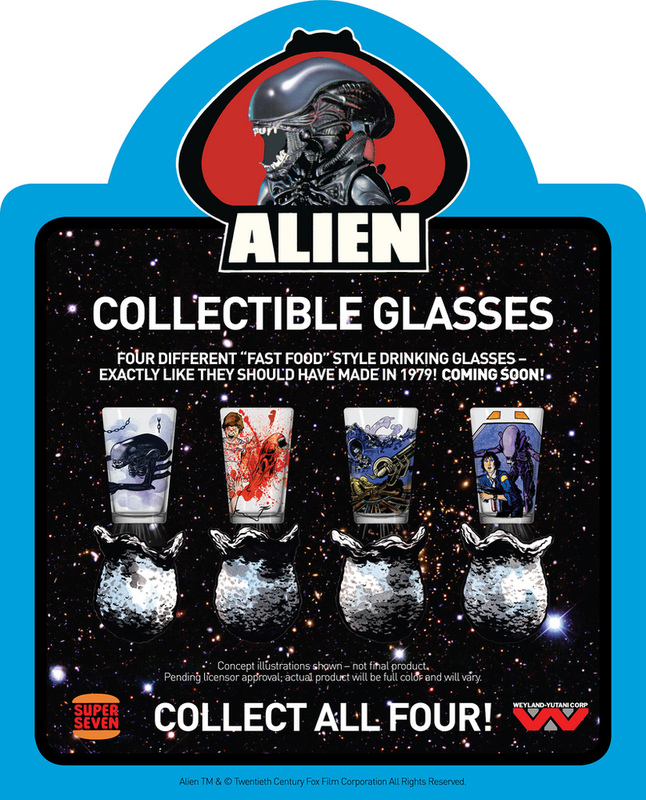 If it isn’t already painfully obvious, I can’t wait for these Alien drink glasses from Super7 to release! This is the first time they’ve provided some really good pictures and announced a release date of July, so I feel compelled to post. Alien was one of the first films that just plain scared the pants off me. I have nightmares about going on bug hunts to this day. The Kenner 18′ Alien is still one of my most prized toys. So these drink glasses have a special place in my want list. Since SDCC 2012 I’ve been talking to you about Super 7’s amazing fast food style Alien glasses that they have in the works. Well, Wondercon is around the corner and Super 7 will be debuting prototype glasses for the first time ever. You can find them at booth #1166.